I haven't been posting too much on the Volvo Ocean Race but in the current leg to Quindao China, the fleet has been struggling upwind while buffeted by monster storm. Ericsson 3, Delta Lloyd and Telefonica Black have suffered significant damage and have dropped out along the course. Video from Green Dragon as posted on the Volvo Ocean Race Video Youtube channel . I'm off to the Classic Moth Midwinters so "Music for Fridays" is early this week. This week we feature two local artists; electronica maestro Bev Stanton and vocalist and folkie, Lisa Moscatiello . I've followed Lisa Moscatiello for many years and what a voice! For the song, "I Can Dream", they have mated a home movie of what looks like the Mardi Gras parade. With the video set in slow motion, it gives a dreamy psychedelic quality to the music. Classic Moth for Sale; "Tippy"
Jim Young has put "Tippy" up for sale. "Tippy" really does illustrate the diversity in Classic Moth designs. Jim built it to a French design from (I'm guessing the time frame here) the 1950's by a fellow named Proust. It is a V chine hull, and at first glance it has some similarity to a Penguin (though the Penquin has a flat bottom). The name "Tippy" is very much of a misnomer as the design is definitely a widebody, a very buoyant design. Jim got Justin to drive the "Tippy" Moth to a win in the Gen 1 division (slower designs) at this years nationals. It is the one Classic Moth design where you could fit two people, say a Dad and kid, or two small teenagers and have a great time kicking around the lake. Here is a picture of "Tippy" on land. Click on the pictures to get a larger image. Jim built "Tippy" out of foam glass with a wood foredeck (the design could easily be adapted to plywood) and is asking $3500. Contact Jim ...........jmsyoun1915....(with our friends at) aol.com. 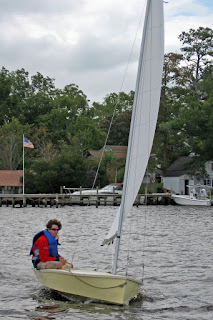 We've been following closely, Dee Caffari's travails with her disintegrating mainsail . It still seems to be shedding large bits of mylar so Dee, just before she reaches the doldrums, has performed another operation. Hopefully this repair will get her to the finish. Dee is currently in seventh with our other women skipper, Sam Davies, currently in fourth. Back in the 70's, Bob Dull and I organized a 24 hour Laser Marathon during the October Annapolis Sailboat Show. We ran it out of SSA, taped flashlights to the bow eye (colored red and green for the appropriate side). We had a lot of fun. Teams were anywhere from super organized 6-8 sailors to teams that were trying to recruit people off the dock at 3 am. We did it for two years and then wrapped it up. We couldn't do it now as the show is too popular and the harbor too crowded for it to be safe. I found a video of Dutch juniors doing a 6 hour relay race in Lasers. A fair bit of breeze and the skipper changeover, in it's various permutations, is hilarious. The barge carrying the cement truck crossing the race course is a nice touch. 6 uren from Floris Wijnbergh on Vimeo. And the grandaddy of all 24 hour dinghy races is the Southport race hosted by the West Lancashire YC in England. Teams race in doublehanded Enterprises (blue sails), GP 14's or Lark dinghies. The action around the gybe mark gets very hairy. The Vanguard 15 class should look into doing something similar in the U.S.
Top competitors - In a local fleet, the one or two competitors where winning is the most important thing. They hate to lose ! and they usually don't. Semi competitors - They are competent racers but are out there more for fun. However semi competitors are very cognizant of where they should finish within a fleet. If they usually finish fourth and beat Ray ..... they are comfortable with this result. If Ray beats them and they finish sixth, it is not a good day. A semi competitor is out there to enjoy the competition but finishing where they assume they should finish is also very important. Pecking order matters. A semi competitor also needs to gauge his finish against a top competitor. Non competitors - Tailenders. They like to belong to the group. They just enjoy being out there and they can be very regular attendees. Stuart's unified theory maintains that a thriving fleet needs all three competitor types to be successful. An ideal fleet size is 12-20 because if a fleet gets too big, a greater degree of randomness upsets the pecking order. If a fleet gets too small, say around five, .... finishing position becomes too rigid. Stuart maintains one of the attractions of competition is the romance, the unknown when one competes. As someone in the audience pointed out, part of what brings racers back is what he termed, intermittent reinforcement .......... or to put it in a real world scenario, if today it is blowing under 5 knots and I am very good in light airs, then maybe today I can beat Ray. Certainly I can apply Stuart's theories to my own sailing. When I realized the International Canoe class had moved beyond where I could compete physically or wanted to compete technologically (both in cost and time)........ when I realized I was not going to get results at my previous level, I moved on. What Stuart's unified theory doesn't explain is how someone picks a fleet and why fleet loyalty is so important. If at Severn Sailing Association I want to race a doublehander class, I can pick either a Snipe, Comet, Jet 14, Daysailor, Vanguard 15 or Johnson 18. Usually once a sailor chooses his class, there is little crossover. When the Comet fleet declined relative to the Snipe fleet, there was not one Comet sailor that switched classes. Another twofer this week. With age comes the watching of those generations coming up. One who I watched grow from toddler to adulthood, has now morphed into an accomplished musician. I know this blog has lacked some highbrow culture. I hope this makes up for it. Tip of the hat to you Katie! John Z. pointed out that I have indeed missed Friday, but this feature has never had a strict timeline. Today is the boppy, upbeat tune with downbeat lyrics from "The Beautiful South"......."Rotterdam". The song takes on the jaundiced eye of a lonely outsider silently dissing everyone else. The people are pickles for sure"
The video doesn't make sense, at least to me, but the bizarre collection of extras is front and center, sort of a out of season Halloween party walking down the highway. I mentioned Dee Caffari hadn't had a surfeit of videos recently, so in the interest of fairness, here is the latest video of Dee now making her way up the Atlantic. You can see the obvious relief that she has survived the Southern Ocean. Unlike the ever positive Sam Davies, Dee has been scared, depressed, elated and underneath it all, determined. Hats off to her and she has prevailed despite a mainsail shedding large bits and the worry that she may be sailing with a mast hiding a fatal flaw (Mike Golding, with an identical boat dismasted below Australia). She is in eighth place at the moment, in a pack of three. Surprise, surprise, surprise ..... someone other than my COF (circle of friends) is reading my blog. Emil K. sent me this inquiry. Great to get your email. The main question when looking at Classic Moths is your weight. If you want to race competitively in Classic Moths, a weight under 180 lbs.is desireable. If you are over 180 lbs, we have Classic Moth designs to accommodate you, but you probably won't win the nationals or place in the top five. If you are a heavy weight and winning is not your bag, we welcome everybody. We even have separate divisions at the nationals for older designs. just recently available but I'm not sure at the boats current status. When I get motivated, I may do a design review of Classic Moth's on this blog. Until then, refer back to some of my Slideshows . George A. informs me that the South Carolina Shelly has been sold. There is a Shelly for sale in Delaware (email Bill .....wpb1210 (with our friends at) yahoo.com, and Tippy, the Gen1 winner at this years Nationals just came up for sale. Some pictures of the Mistral design. First, Craig Saunders beautiful home built, all varnished Mistral. Note the circular transom. No form stability here! Add a picture of Derek Dudinsky's Mousetrap (which is a modified Mistral with a wider transom). Sitting on the dolly you can see the radical V shape of the hull. Not a whole lot of hull in the water! Double click on the images to get a higher resolution picture. Time for an update. Sam Davies on Roxy has rounded Cape Horn and been in the Atlantic for some time. At present Sam is about on the same latitude as Buenos Aires, Argentina. She currently holds down fourth and has put some gains on Marc Guillemot on Safran, who had pulled into the Falkland Islands to fix his mast track. Bubbly as ever on her latest video. Dee Caffari on Aviva, remains in eighth. She has rounded the Horn, but was held back, along with her traveling companions, Brian Thompson, and Arnaud Boissières, to let a vicious storm pass to the North. She has been limping along, restricted in going full on by her mainsail, which continues to shed mylar and taffeta. No recent YouTube videos of Dee but you can see some up to date videos of Dee at the Vendee Globe Website . Informed sources say the mainsail cloth is a special lamination also used by the Volvo Around the World racers. They are finding it doesn't take being reefed for long periods of time. Dee is waiting for a weather window for the next round of repairs, probably Tuesday. From one of my favorite movies O Brother, Where Art Thou , this is the sirens song. Our three convicts, on the lam and rushing to retrieve some ill gotten loot before it gets covered over by a lake, encounter three sirens singing a lullaby. The Coen Brothers loosely based "O Brother, Where Art Thou" on Homer's Odyssey. The lullaby, "Go to Sleep Little Babe" was song by Emmylou Harris, Alison Krauss, and Gillian Welch. There is a large amount of crap on YouTube. So it is always a joy to find a professional videographer slumming on YouTube, particularly spinning a sailing adventure with video. Dylan Winter is attempting a counter clockwise circumnavigation of England in a Mirror 19 (think of a stretched Uffa/O'Day Daysailor with bilge keels). He is recording everything in a crisp and witty multi-part YouTube documentary. There is no rush. His Mirror 19 is presently under cover for the winter with his voyage only making it around the South Coast and up to the Crouch (just north of the Thames) for the first year. Here is a three part sample of his trip up the Crouch and Roach. Sorry, videos have been removed! "His wife of 52 years, Reba Watson Heyman .... added ..... every eight years he wanted to re-pot himself." Re-pot himself .... what a wonderful term for someone who takes another direction in life, someone unpredictable, someone who takes up another interest, another career. From the bio on YouTube, this video looks to be the work of a 16 year old from Argentina. Damn fine job! For all the Euro nuts in the Classic Moth. (I know, all the Classic Mothies are nuts). A band of bugs gets flung off a dog, hightails it to the nearest human who is washing dishes, she freaks, brings out the bug spray, a bug fantasy ensues before death. End of story. A very neat animated video. For the three or four regular readers of this blog, it is easy to deduce that I'm following the two women on the Vendee Globe Around the World Singlehanded Race. 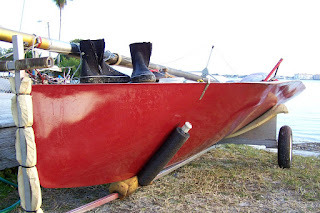 On our last post, we said that Dee Caffari had some sail repair to do on her main. This video gives a how-to on main repair on an Open 60. That main looks rather sad! With all the destruction of those in front, our every day effervescent Sam Davies finds herself currently in 5th (that may not be technically true as Marc Guillemot in 6th has been awarded 82 hours for the rescue of Yann Eliès). She is zeroing in on Cape Horn and her morale may be on the upswing but it's hard to tell with Sam as she is always upbeat. The video mixes French and English. Neat time lapse video of building a 40 foot shallow draft cruiser. Construction looks to be strip plank, then cold molded, over bent frames. These guys have a blog all about the construction, which I, unfortunately, haven't read, so what I have written above may be completely in error. While doing research on previous posts, it occurred to me that some momentous historical events in dinghy sailing took place in 1969. First, as mentioned previously, the International Moth Class merged with the Australian Moth class in 1969. With this union, the class adopted the higher aspect fully battened Australian Rig, wider beam with racks and the squashed bug symbol. Certainly these additions set the tone for the International Moth class to continue as one of the premier development classes going. Second, the International 14, after banning the trapeze in 1938, voted in 1969 to adopt it. It was one of the last "performance classes" of that time to adopt the trapeze. It wouldn't be until the 1980's that the International 14 would follow the International Moth's lead and merge with it's Australian counterparts, again adopting most of the Australian rule. Thrid, Ian Proctor designed the Topper dinghy, the first mass produced injection thermoplastic class in the world. At 46,000 sold it probably ranks third in singlehander numbers, behind Laser and Sunfish. I'm sure there are other 1969 dinghy sailing notable events. As discovered, I will post them. As a follow on to my post about the Brass Monkey Handicap Race ..... this is Bala Sailing Club's Handicap Race which occurs annually in February. This video was taken eighteen years ago, in 1994, before Laser, Topper, RS and others developed a profusion of new dinghy classes for the English market. So we watch the tried and true classes such as the 505, Fireball, Contender, GP14, and Enterprise (blue sails) coping with some very blustery conditions. 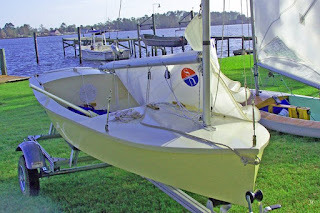 Video was posted by " SailAction who, like Shockwave40, has some other first rate dinghy sailing videos. Sorry... Broken link.... Warner Music Group YouTube police. When looking for Randy Newman's "I Love LA" video, I happened upon Cheech and Chong's parody of both Bruce Springsteens "Born in the USA" and Randy Newman's "I Love LA". What do you have when you combine a nonsensical barnyard song sung by English Rockers and then add a Japanese video that depicts the leader of a gang of toughs having some fun in a video game parlor. Add all those barnyard animal calls! Packs it in until spring. For those really up north, pulls out the ice boat for some hard water racing. Makes a trip to, hopefully, warm and sunny Florida or California for the class midwinters. For New England or the Mid-Atlantic dinghy enthusiasts, buy a Laser or Sunfish, a comfy drysuit, warm sailing gloves and boots, and frostbite. The English, on the other hand, with their smorgasbord of dinghies, run very large handicap events throughout the winter. When it comes to a variety of dinghy classes, no one can trump the English. From one of the most prolific dinghy sailing videographers on YouTube, Englishman Shockwave40 , with over 120 videos, we view various singlehander classes racing at the Brass Monkey Handicap at Yorkshire Dales Sailing Club . He captures a diversity of designs, both old and new. We start with the Laser Vortex, a small catamaran designed by Jo Richards, with solid deck, an assymetric spinnaker and trapeze. Next is the Internatonal Contender, designed by Ben Lexcen; the first of the trapeze singlehander classes. Wood hulls are still very popular in this class. The Musto skiff appears next. The latest generation in singlehanded design with trapeze, racks, and assymetric spinnaker. Next up, a conventional hiking dinghy, the Phantom dinghy is one of many English singlehander designs that occupy the same slice of the sailing market (12' -14' hiking singlehander) now dominated by the Laser. The Phantom was designed by Paul Wright and Brian Taylor in 1971. OK dinghy follows. The OK dinghy was designed by Knud Olsen of Denmark in 1958. It was initially the build it yourself trainer for the Olympic Finn. The Laser killed the OK dinghy in North America but the OK Dinghy still remains a very popular international class. See this OK Website for some great photos. 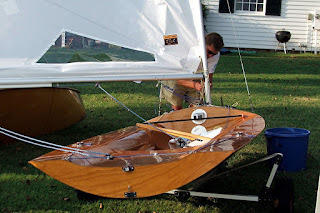 With the OK, rounding on the inside, is the Topper scow, designed by Ian Proctor in 1969. It was one of the first Injected Thermoplastic designs. When it was first introduced, the Topper was raced by both adults and juniors. Today the Topper is primarily the mid junior singlehander for England, the next step from the Optimist. Finally, we have the ubiquitous Laser, the one class you could truly say that you will find at least one at almost any sailing club, anywhere in the world.